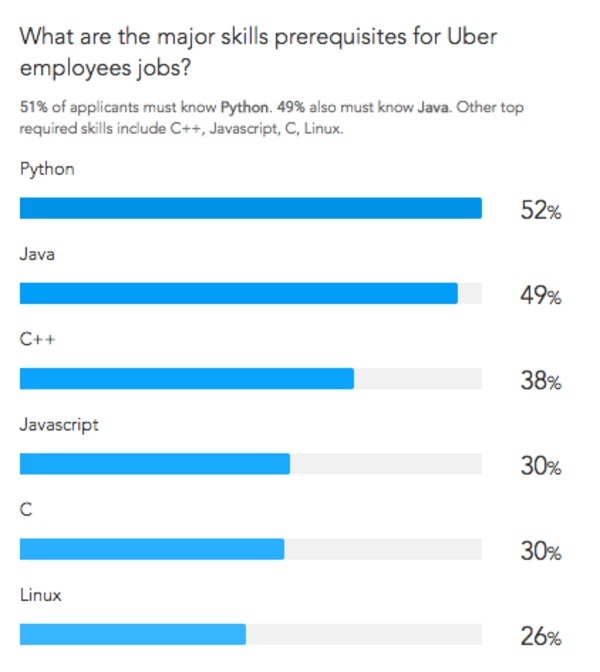 Uber is considered a holy grail employer for many in the tech industry. The company offers some of the highest salaries, above average benefits, a sense of autonomy, and one of the most innovative atmospheres in the Silicon Valley and beyond. With about 10K people and growing in their workforce, many Uber employees enjoy everything they have to offer. And with their recent financial success, Uber can certainly afford to attract and retain some of the world’s top talent. Uber was started in 2009 by StumbleUpon co-founder, Gary Camp and programmer/businessman Travis Kalanick under the name “UberCab.” Camp developed the concept and Kalanick funded it with a generous 19 million he’d made in the sale of a startup in 2007. After spending $800 on private car services one New Year’s Eve, Camp started mulling over ways to make luxury car service more affordable through cost-sharing and ride-sharing with friends. Following a successful beta launch in 2010, the UberCab became Uber, and the app successfully initiated in San Francisco in 2011. Back then, the service only allowed users to hail a black luxury car which cost on average 1.5x the amount of a regular taxi. Responding to an increasing demand for a lower-priced option, Uber launched UberX in 2012. This interested parties to join Uber as drivers, subject to a background check, using their own vehicles. In 2014, Uber launched an even more affordable alternative in the form of a ride-sharing option. Thus UberPool was born, allowing riders to travel together if they are heading in the same direction. The price for UberPool is less than UberBlack (the luxury option) and UberX. That same year, Uber made international news by partnering with Blade to offer New Yorkers helicopter service to The Hamptons for $3,000. While Uber is a top ranking tech company and considered by many to be a great employer, they have not been without their controversies. Drivers have cited unfair operating fees, undercutting of their wages, and weak safety standards, among other complaints. Multiple female employees at their San Francisco offices have also come forward to the media, alleging humiliation, sexual harassment, and discrimination. Will these gaffes and controversies be the final blow for the transportation and tech giant? Likely not. Despite their issues, the future outlook for Uber is positive. They are currently expanding their reach to underserved areas like Upstate New York. Their UberEats food delivery app has been immensely popular, expanding to a network of more than 40,000 restaurants worldwide. Uber is also coming in hot on Google’s heels with their own self-driving car project. And some business experts believe they may even be the hottest IPO of 2017. People who expect Google-esque perks such as in-house massages may want to look elsewhere for employment. But that doesn’t mean that Uber doesn’t have a generous benefits package for their employees. High salaries, free food, and in-house laundry facilities are among the ways Uber continues to attract top talent to their company. Many have left cushy jobs at other Silicon Valley tech companies to make good on Uber’s promise for “rocket ship growth” for its highest performers. On top of the usual employee benefits like sick leave, retirement, and healthcare, employees also get a certain number of free Uber rides per year. Not much is known about what kind of health coverage Uber offers their employees, but a 2015 article on Inc.com states that they provide nap rooms for employees in their San Francisco office. This is to improve productivity and keep employees from leaving work if they don’t have to. It appears that Uber does not have an official family leave policy, but instead leaves it to the discretion of managers to work out with their team. This is based on a 2015 response to a Quora question on the topic, but this may have changed in the interim or might change in the future. As you can see from the data above, Uber enjoyed upward growth between early 2013 and early 2015 with a steady leveling off in 2015-2016. 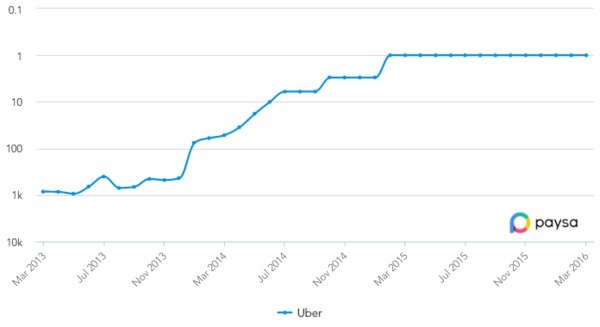 So there’s no doubt that Uber employees are some of the most driven in the industry. But are they well compensated to match their efforts? The answer is a resounding “yes!” Paysa has gathered salary data from 2K Uber employee profiles to find an average overall salary of $280K with most salaries ranging from $186K $379K per year. This includes an average base salary of $146K, an annual bonus of $16K and company equity of $118K. With salaries like that, it’s easy to see why the Silicon Valley’s top talent are flocking to this emerging tech giant in droves. Let’s explore some of the highest paying tech positions at Uber, taking into account base salary, annual bonuses, and company equity. The average market salary for an Engineering Manager at Uber is $357K a year, ranging from $272K to $464K. This includes a $175K base salary, a $19K annual bonus, and $163K in annual equity. The average market salary for a Platform Engineering Manager at Uber is $352K a year, ranging from $292K to $415K. This includes a $163K base salary, a $20K annual bonus, and $169K in annual equity. The average market salary for a Senior Software Engineer at Uber is $330K a year, ranging from $263K to $400K. This includes a $169K base salary, a $16K annual bonus, and $145K in annual equity. The average market salary for a Product Manager at Uber is $293K a year, ranging from $231K to $356K. This includes a $153K base salary, a $17K annual bonus, and $123K in annual equity. The average market salary for a Product Manager, Growth at Uber is $260K a year, ranging from $211K to $312K. This includes a $137K base salary, a $19K annual bonus, and $105K in annual equity. For those with talent, resilience, and grit, Uber is a high-reward workplace with seemingly unlimited growth potential. They hold the #4 spot on Paysa’s SalaryRank, calculated by our large scale salary data and patent-pending machine learning platform. Despite the increasing number of copycat app-based transit services emerging in the market, Uber shows no signs of slowing down. This is a company that values boldness, autonomy, and ingenuity in its employees. The environment is fast paced, and certainly no place for slackers. But if you’re willing to step up your game to match their high standards, Uber is an ideal workplace for high achievers who are looking to make themselves a name in the industry. Interested in learning more about employment at Uber and other top tech companies? Visit paysa.com now to get started.